For a grand Outer Banks retreat where the water steals the scene, head to The Salty Dog. Just outside your front door is the Atlantic Ocean, so of course the views from your deck are great. Your beach access is only 300 feet away. 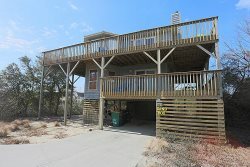 This comfortable 5 bedroom, 5 bathroom home has everything you need for a great family vacation. What's even better is that the family dog (70 lbs. or less) is invited to join you to make it the perfect vacation for the entire family! The PRIVATE POOL (11' x 25') is always a favorite, and for those who need to stay connected, there's HIGH SPEED INTERNET and free long distance phone service. You'll have plenty of space for spreading out when you need privacy and a RECREATION ROOM for fun in the evenings. When it’s time to relax, guests will find that the five bedrooms have been beautifully appointed with all the extras, including jacuzzi tubs, TVs, private bathrooms, deck access, and/or all of the above. Enjoy your meals by grilling or preparing them in the well-stocked kitchen. You have plenty of extra pots and pans so plan to cook in while you're here. New owners (as of 2014) have already made countless upgrades to make your stay the best experience ever! If your family has been looking for the perfect home to turn their vacation into perfect memories, look no further - you've reached your destination at The Salty Dog! * Tour the Wright Brothers National Memorial, where, in 1903, the first successful airplane flights took place and the "age of aviation" was launched. * Enjoy a variety of water sports in the Atlantic Ocean or Albemarle Sound: kite boarding, surfing, kayaking, swimming, boating, fishing and more. * Unique Dining Experiences: Fresh local seafood, fine dining, Mexican food, Italian food and much more. 300 feet to Atlantic St. beach access.